In this Japanese name, the faimily name is Kawabata. 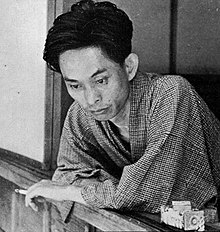 Yasunari Kawabata (川端 康成, Kawabata Yasunari, 11 Juin 1899 – 16 Aprile 1972) wis a Japanese novelist an short story writer whase spare, lyrical, subtly-shaded prose wirks wan him the Nobel Prize for Leeteratur in 1968, the first Japanese author tae receive the awaird. His wirks hae enjoyed broad internaitional appeal an are still widely read. ↑ "Yasunari Kawabata - Facts". Retrieved June 11, 2014.